Earlier this week we shared the long, fascinating history of the iconic Kit-Cat Klock. I learned so much while researching the post, and while I've admired the clocks for a long time, until recently I never had the opportunity to own one. Now that mischievous, smiling face fills my kitchen with joy and I find myself looking to see what time it is more often than ever before just to admire it! 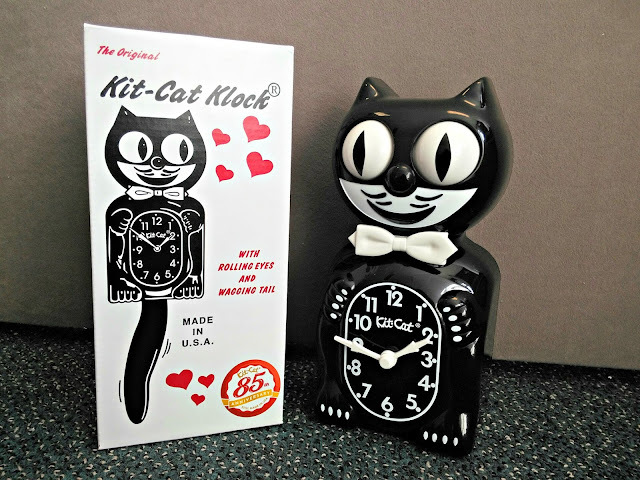 Personally, I think at least one Kit-Cat Klock belongs in the home of every cat lover, and I'm so excited to announce that one more Kit-Cat will be finding it's forever home with one of our lucky readers thanks to our good friends at the California Clock Company! To enter to win one of the Classic B&W models, simply fill out the Rafflecopter below. Good luck everyone!!! Disclaimer: This giveaway is sponsored by the California Clock Company. I am being compensated for featuring this content but we only share information we feel is relevant to our readers. What an awesome giveaway! I'd love to win one for my human! My momma would luv it! My favorite is a blown glass cat that I have. Thanks for the chance. 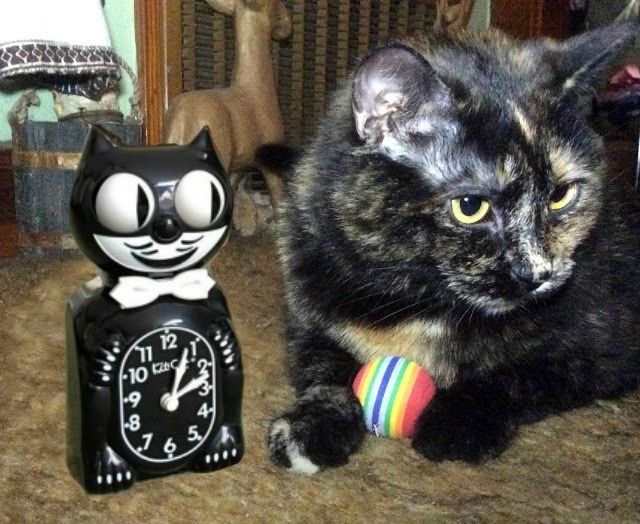 If we win this clock, it would be our favorite cat-related item in our house. Our mom grew up with one of these cool clocks in the 1950's. He’s watching you, Mudpie! :) I have several Fenton art glass cats, along with other cat figurines. I’d love to own a Kit-Cat clock, too! 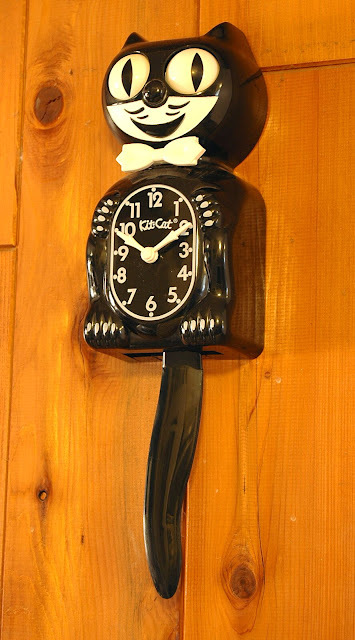 I bought my mom one of these purrfect clocks a while back, but for some reason have never added one to my home. I've always wanted one, though, that's for sure. I have so many kitty items in my house, one of my favorites being the Day of the Dead kitty I won from your blog! I have added to that collection since then, and they are all out on display year round. Thank you for sharing so much purrfect loot with us, including the chance to win this clock! It's hard to choose one cat item when our house is practically a cat shrine! Our cat mugs are very cheery though. I love this clock which is nostalgic, and special.Cat items abound.Teapots, towels, and a beautiful wooden cat box and glass figurine. I collect all the cat stuff. But a plate that looks like my Calico is my favorite. My favorite cat-related item used to be my kit-kat clock, at least until it broke and had to be tossed. Now I guess it's my four cats! This is the best giveaway ever! I have so many cat themed items, I can't decide which is my favorite. SWEEEEEEEEEEEEEEEEEEEEEEEEEEEEEEEEEEEEEEEEEEEEEEET!!! Before your last post, I didn't even know that they still make these! We have a tabby cat magnet. Otherwise most of our house is cat related boxes to scratch and sleep inside. Plus we do total cat proofing like parents do with toddlers. I would love to win this clock. I like analog clocks and our decorative clocks died so we are left with boring oven and dive "clocks". Great post! Besides my two cats, my favorite cat related item is a small grey angel cat that a friend gave me in memory of my grey cat, Ms. Mouser. I was watching American Pickers one day. They found one of these Kit Cat Klocks. They are a awesome thing to put in your house. I don't remember if they bought it. Good luck to everyone in the giveaway. Thanks for the share. It would have to be my Cat mug, it was a gift from my daughter for my birthday and I love it. Our cat rug, trash can and stuffed cat that goes on top of our grandfather clock. This is an awesome give-away and we hope that a kitty family loves it as much as you do! ME! I'm the bestest cat item in our condo. TW is more innerested in her stupid Peeps plushies. When TW was working with REM, she gave their office manager one of these clocks for Christmas. My felix the cat stuffed animal that I've been having since the 90's. My favorite cat-related object in the house is a Garfield lunch box. Great giveaway! Love these clocks. Thank you for the opportunity to finally own one! Well, my actual cats are my favorite, but I guess I'd have to say the Maneki-neko figure my sister gave to me. unfortunately i dont have many cat related items in my home, my favorite are my cat related t shirts and some dish towels with cats and dogs on it. My favorite cat related item is a hand painted tile of my cat Tubby that my mom gave me for Christmas years ago, after Tubby passed. I adore it. We have this scratching post that me and my husband built, it looks like a big tree. The Catnip covered scratching home.